What kind of ant are you? teowaki is —and will always be— free for public contents. It is one of the ways we have to contribute back to the open source community and to all the awesome events the different communities organise. As an individual user, you can also enjoy free of charge your own personal area where you post private links and practices for your eyes only. After our first months of public beta, I am excited to announce teowaki’s price plans, for developers who need to share contents privately with others. Are you a soldier ant? Do you work from the trenches to make your startup or small team successful? Teams of up to 4 people can enjoy teowaki for as low as £12* per month. Are you a queen ant? Do you have a team you feed and take care of? 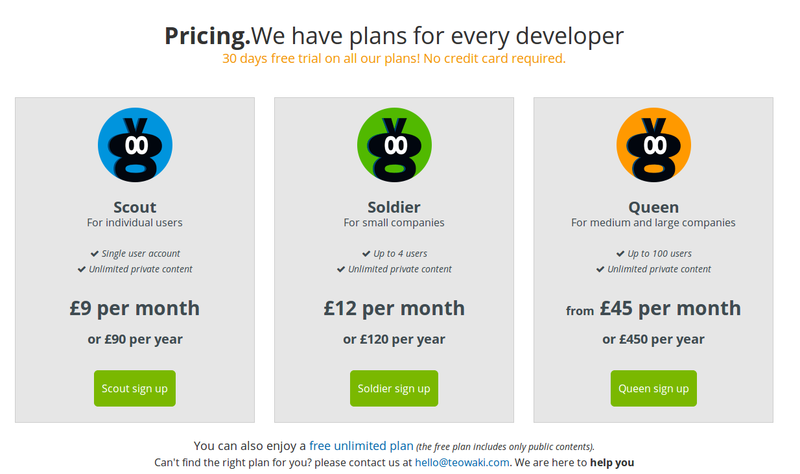 Teams from 5 to 30 members pay £9** per month per developer. Teams of over 30 members pay a flat rate of £400***. Are you a scout ant? Do you like the freedom of working on your own while being able to share privately with other individuals and organisations? Individual users pay £9** per month. If you pay yearly, you will pay only for 10 months every year in all the plans. All our price plans come with a 30 days free trial. You don’t need to enter your credit card in advance, because we hate sites that ask for your card before letting you judge if they are good enough for you. And of course you can upgrade, downgrade or cancel your plan without any restrictions. It took us a while to figure out the best plans for our users, and we think our proposal is a fair one. But if you would like to have a personalised plan for you or your organisation, contact us at hello@teowaki.com and let us know what is your idea. We will try our best to accommodate to your needs. Who said RSS is dead? Well, it wasn’t me. RSS is a great way of getting updates when you have a feed of news. There are RSS readers virtually for every device and programming language. Don’t you believe me? Then take a look at this developer working on a RSS aggregator in COBOL. When we thought of which mechanism we should use for users to subscribe to their notifications, it’s no surprise RSS was our first choice. So let me introduce you without further ado our brand new RSS feed service for your notifications. Just log in into teowaki —if you were already logged in, you might have to reload the page— and you should see the notification feed links right below the menu, as you can see in the picture. Pick your favorite format, Atom or RSS, and add it to your favourite reader. I have installed a generic RSS reader on my phone, so from now on I will never miss any updates from my developer friends, even when I am not logged in into teowaki. 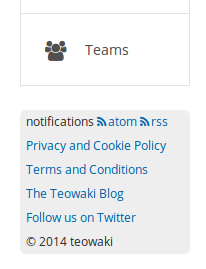 If you are experiencing any difficulties using your notifications feed, get in contact via hello@teowaki.com and we’ll try our best to help you out. RSS is dead, long live RSS! This past weekend we were at the Fosdem conference, in Brussels. It was a great event, and of course there was a lot of communication between the attendees, as you can see in the sample tweets below. The problem with this kind of tweets is that most of the followers of the authors were not at Fosdem, or even in Belgium. So for them, those messages were useless and just noise. And we hate noise. We just added geolocated shouts to teowaki, so now you can send a message to one or all of your teams, but only to people who are around a physical location. Let me show you an example. Ada feels like downing a beer today, so she sends a shout inviting her friends around her location to meet later. Diego and Javier share teams with Ada. Ada is in London, as is Javier. But Diego is in Madrid today. Javier will receive Ada’s shout as a notification, and will also see it on his timeline. Diego won’t be notified about this, as Ada decided only people within 5 kilometers from Old Street, London, should get her shout. But even if Diego won’t get any useless noise in his timeline, he can still know about this shout. If he navigates to the team’s page, or if he filter the shouts for a given team, there it is, the message from Ada. He can be updated on what his teammates are up to, but he won’t get notified about irrelevant messages. I hope you will enjoy this little new feature as much as we do. As usual, feel free to contact us at hello@teowaki.com if you have any feedback. Happy shouting!